The Miscea Sensor Activated Faucet is no ordinary sensor-activated faucet – it boast the ability to dispense both soap as well as a choice of disinfectant or lotion, all without touching the faucet. 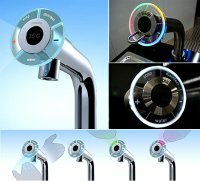 Constructed from high quality stainless steel and coming in an elegant design, chances are you’ll go wash your hands more frequently within a week than you’ve ever done in your entire lifetime just to see the faucet head’s LED lighting function whenever you point your hand to the control sensors. You even use motion control to adjust the water temperature, simply by bringing your hand to the plus or minus signs. This hygienic and convenient touch free interface will definitely go down well with folks who are paranoid about dirty faucets. No idea on how much it costs, but cheap definitely ain’t the adjective I’m looking at.